The new paper by Pawel Bukowski and Filip Novokmet “Inequality in Poland: Estimating the Whole Distribution by g-percentile 1983-2015” combines national accounts, survey and tax data in order to provide consistent series on income distribution in Poland from 1983 to 2015. It is accompanied by the paper “Top Incomes during Wars, Communism and Capitalism: Poland 1892-2015”, by the same authors, which focuses on the long-run evolution of income concentration in the country. Highlights: The frequently quoted Poland transition success has largely benefited top income groups. The top 10% income share has almost doubled since the end of Communism, rising from levels slightly above 20% in the 1980s up to 40% in 2015. Over the 1989-2015 period, the top 1% has captured almost twice as large a portion of the total income growth than the bottom 50% (24% versus 13%). 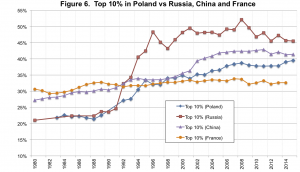 However, the transition from communism to capitalism has led to lower income concentration in Poland than in Russia. The paper relates this phenomenon to different transition policies, institutions and natural resources endowments.